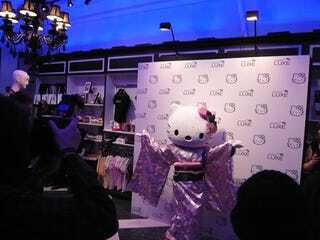 Last night, there was an opening party for the new Sanrio Luxe store, in New York City's Times Square. In attendance: Lisa Loeb, Heatherette designer Richie Rich, noted socialite Tinsley Mortimer, drag legend Lady Bunny… And Hello Kitty herself, wearing a gorgeous kimono! On display were all of the items one will be able to purchase at the new store: $100 Cashmere scarves, blingy jewelry, luggage and designer leather gloves. Get cat scratch fever, after the jump. The store itself is rather lovely, what with the chandeliers and whatnot. In fact, if Santa wants to bring me this chandelier — and an apartment to put it in — that would be great. The more champagne I drank, the more I wanted to shoplift. People! Cluster around the booze, why don't you! Some of the jewelry is gorgeous. Pearls are so very now. Also very now: Gloves. Someone working the party told me these are "big in Japan." The bling mesmerized me with its sparkleosity, not that that's a word. It's by Kimora, of course. Hello Kitty Mary Janes! As the kids say: WANT. Luggage, sneakers, everything "luxe," everything Kitty-covered. This silver stuff was in the kids' section, but I found it very attractive. As in lust-worthy. One of these bling-covered Pez dispensers was in my gift bag. Delightfully impractical! Here's a shirt for Malia and Sasha Obama: Presidential pound puppy for the win! The legendary Lady Bunny was the DJ of this event. She played Britney's "Womanizer," Beyoncé's "Single Ladies" and some Deee-Lite. Hello Kitty arrived on the scene! So did Heatherette's Richie Rich. There used to be Hello Kitty/Heatherette mashup stuff, maybe he'll so some again? The Bunny and the Kitty had some kind of vogue-off. I think Hello Kitty won. Lisa Loeb showed up, and was frickin' adorable. Tinsley Mortimer arrived. She is no bigger than a newborn fawn. Are the Japanese into her or something?